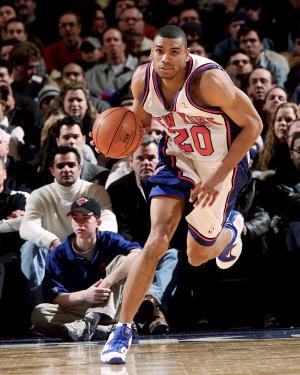 Allan Wade Houston was born on the 20th April 1971, in Louisville, Kentucky USA, and is a former professional basketball player, who played in the NBA from 1993 until 2005, developing his career with the Detroit Pistons and New York Knicks. After three years without playing, in 2008 he tried to return to the Knicks but ultimately did not enter the team. Being 1.98 meters tall, he played in the position of shooting guard. How rich is the former basketball player? It has been estimated by authoritative sources that the current size of Allan Houston net worth is as much as $75 million, as of the data presented in the middle of 2016. To begin with, Houston was raised in Louisville, Kentucky and played in the team of Ballard High School, winning the Kentucky state championship in 1988. Then he joined the University of Tennessee, in which he spent four years, trained by his father Wade Houston. Concerning his professional career, Houston obviously starred at university, as he was selected 11th in the first round of the NBA Draft 1993 by the Detroit Pistons, subsequently scoring 8.5 points per game for his year as a rookie. The following two seasons his average was 14.5 points and 19.7 points per game, but in 1996 after the expiry of his contract, Houston signed as a Free Agent with the New York Knicks. In his first season with the Knicks, he kept his offensive average with 17 points per game, then helping his team to reach the NBA Finals in 1999. His most memorable action took place in the 5th game of the 1st round of the play-offs in 1999 against the Miami Heat. Allan Houston won the ball and tried a shot while there were only 0.8 seconds to play, scoring and the Knicks won the game 78-77 and the series. The Knicks went on to lose in the NBA Finals. Houston also participated in the All-Star Game in 2000 and 2001. In 2001, Houston signed a contract extension with the Knicks for $20 million made him basically un-transferable, accentuated by recurring injury problems. Houston missed 32 games in 2003 – 2004 due to a knee injury, although he said he would be ready for the next 2004 season, he was able to play in only 20 games of the following season because he had not recovered sufficiently from his injury, which ultimately forced Houston to announce the end of his career on the17th October 2005. Houston is considered to be one of the most prolific shooters in the history of the Knicks. On the 30th March 2007 when his contract with the Knicks was going to expire, Houston announced that he was considering making a comeback. Although he had not played in the league since 2005, Houston was the second highest paid player in the league in the 2006 – 2007 season with $20.7 million which undoubtedly increased the outright size of his net worth. The Knicks signed a contract the terms of which were not disclosed. In the autumn of 2007, Houston joined the Knicks training camp, but after just one week and playing only six minutes in a pre-season game against the Boston Celtics, Houston decided to end his comeback. However, then Houston played with the Phoenix Suns in a preparation match in the autumn of 2008, hoping for another comeback attempt, but then the Knicks announced that he had signed a contract to play in 2008. However, he did not play any matches, and joined the management team of the Knicks as assistant general manager. Finally, in the personal life of the former basketball player, he has been married to Tamara Houston since 1996, and they have two children. He is said to be a personal friend of the President Barack Obama. 3 Gaurd for the Detroit Pistons (1993-1996) and (1996-2005) Guard for the New York Knicks. 4 Attended Ballard High School in Louisville, Kentucky. 6 Children: daughter Remie Jean (b. May 1999) and son Allan Wade Houston III. 7 Earned $68 million dollars in 1997 Weight: 200 College: Tennessee A Good Friend of Kansas Center Reaf Lafrentz. Lives at Long Island NY, in North Shore. 8 Selected by the Detroit Pistons in the 1st round (11th pick overall) in the 1993 NBA Draft. Signed with the New York Knicks as a free agent on July 14, 1996. NBA Basketball player.